One generation praises your deeds to the next and proclaims your mighty works. Psalm 145:4. They were projects that took me years to complete. And in the end, I wasn’t even the one who completed them. In fact, I wasn’t even the one who started them. Two old quilts. The first one came from my son-in-law’s grandmother. 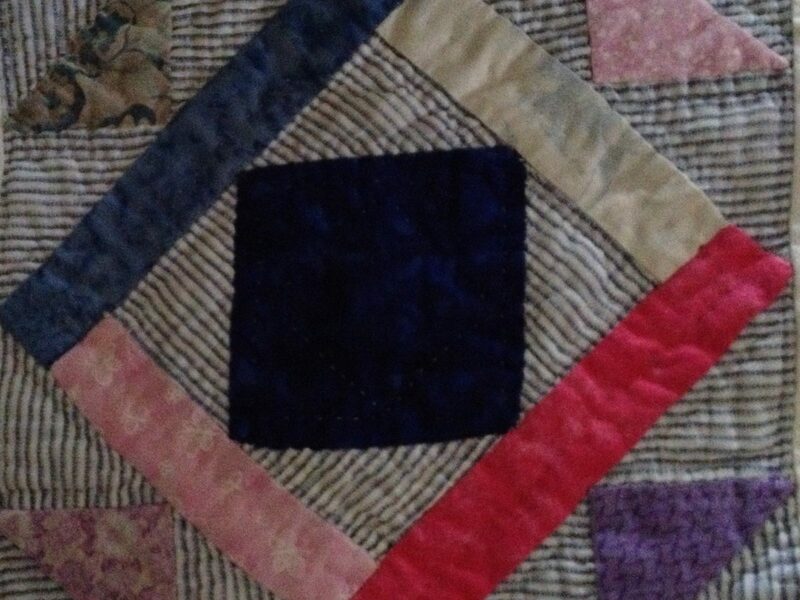 My daughter wanted her little girl to have a quilt her great-grandmother made and her grandmother (me) restored. I picked another one up in an antique store. Its crafter remains unknown. So there was one quilt for each granddaughter. Restoration was my task. To take two old things–no longer pretty–and only one with family significance–and infuse them with beauty, function, and meaning. I began to gather scraps for the girls to carry through their lives and pass along later. Everywhere I went I hunted for a fabric store–a challenge I relished! I found one fabric with daisies, my sister-in-law’s favorite flower, and another with lilacs, my personal favorite. There were Disney characters. Frogs to honor a daughter. Fireworks to note a son. Scraps from dresses I made the girls. Fabric I brought from China to make the girls’ Easter frocks a few years ago. There were swatches from family army uniforms to remember those who served our country and a piece from my wedding gown. And there were small words of wisdom woven into cloth. Admonitions to find joy. The encouragement that maybe life isn’t as bad as one day’s circumstances might indicate. “What the caterpillar calls the end of the world the Master calls a butterfly,” from Richard Bach, in subdued chartreuse with a pencil sketched cocoon. I made the quilts so that they could decorate a bed or hang on a wall. They can keep the girls warm, but they are more than that. They are beautiful, but they are more than that. They remind us of places, moments, and people. Once complete, each patch in place, the quilts were not finished. I added a new backing to each one. I began the chore of sewing the layers together. Making old and new one thing. Yet they still were not finished. I wanted the girls to have their quilts before they finished growing up. Then I found Annie. Annie is an Amish lady who quilts faster than I can blink. Work that would take me more years took her weeks. And I got to tell the girls about the Amish way of life. No electricity. No television, computers, Ipods or Ipads. No dishwashers, no electric washers or dryers. No radios. No household telephones. Just work, prayer, fellowship, and artistry. Two piles of fabric. Begun by a loved one and an unknown one. Stitched into memory and meaning over time. I only knew one grandparent and have no memory of a word from him just for me. His voice and those of my other grandparents came to me secondhand from my parents. Two quilts: generations sewn together through words and fabric and passed to younger ones to carry with them, keep them warm, and show them beauty. My voice, firsthand, to them.